At the beginning of the rainbow lies the Rainbow Pool, a place where any pet with a Paint Brush can bathe in the waters and transform into another colour! Rather spiffy, eh? Whether you want your pet to sprout wings with the aid of a Faerie Paint Brush or grow scales and fins with a Maraquan Paint Brush, you're going to have to get a brush! Paint Brushes can be gained from random events, contest prizes, and even some dailies. 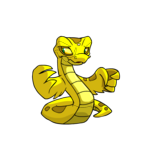 The Hidden Tower also sells four exclusive Paint Brushes (Baby, Darigan, Maractite and Royal), but the most reliable way of getting a Paint Brush is to buy one off another user. Most brushes can be found on the Trading Post since they're so expensive, but the Shop Wizard may also be a good place to look for cheaper ones. However, there are some colours that aren't available through Paint Brushes. Lab Ray and/or Rainbow Fountain Only: Alien, Chocolate, Coconut, Clay,Custard, Garlic, Ice, Jelly, Mallow, MSP, Robot, Snot, and Sponge. 8-Bit Colour: 8-Bit was exclusive to the Lab Ray until the release of the 8-bit Power-Up Potion. Technically, the potion acts similar to a Paint Brush, but you do not need to go to the Rainbow Pool to use it; you can use it from your inventory. Fruit Colours: These are available for Chias if you feed them magical Chia Pops. With these, a Chia can become Chokato, Carrot, Orange, Pea, Plum, Tomato...you get the idea. Mutant Colour: Mutant Pets come from Dr. Sloth's Transmogrification Potions. They can also be received through the lab ray. 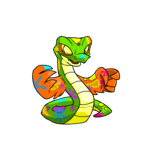 Magma Colour: Magma Pets can only be painted by taking a dip in the Magma Pool. Alright, so this part is pretty straightforward. First, go to Neopia Central then click on the small pool with the rainbow coming down into it. Once you get there, you will see the Paint Brushes you have in your Inventory. Your pets will be listed at the bottom of the page with a dropdown in which you will find the colours available for that particular pet. And voil�! Once your pet has been blow dried, you're instantly taken to the Quick Reference page where you can see your pet in all its new glory! So, see? Painting a pet is as easy as pie! Getting the Paint Brush is the hardest part. 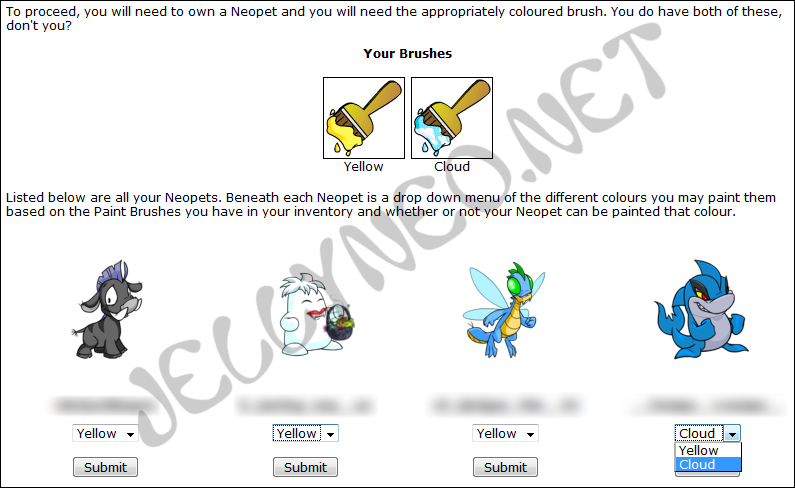 If you're having trouble deciding which colour to paint your pet check out theNew Rainbow Pool, right here on JN! You can preview all pet colours currently available. If you just want to look at Paint Brushes, check out this search in our Item Database!